Give managers the tools they need to build strong, resilient teams. These days three, four, or even five generations work side-by-side. Each generation, from Gen Z to Baby Boomers, has its own communication style, a distinct relationship with technology and pre-defined expectations about life balance—yet managers must guide, engage and motivate all of them. 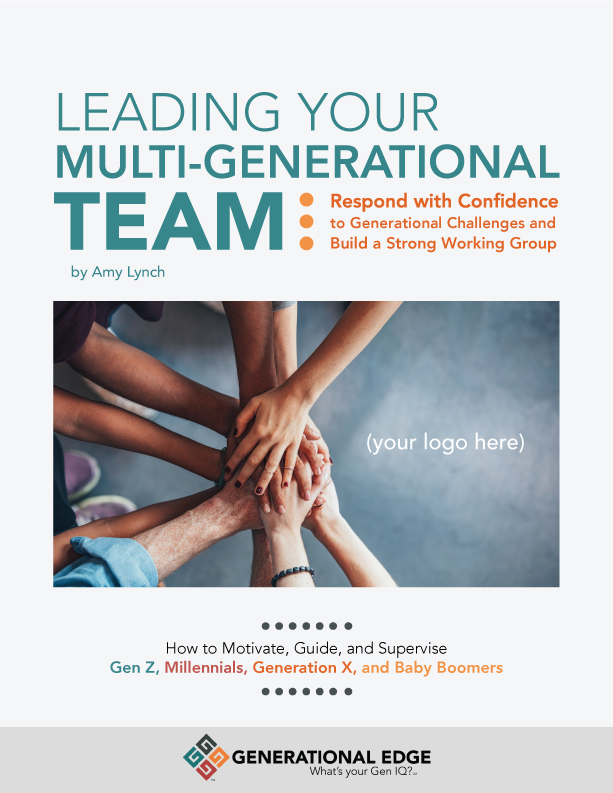 Leading Your Multi-Generational Team is an actionable, easy-to-use reference that managers turn to for do-this-now solutions when they encounter generational disconnects. 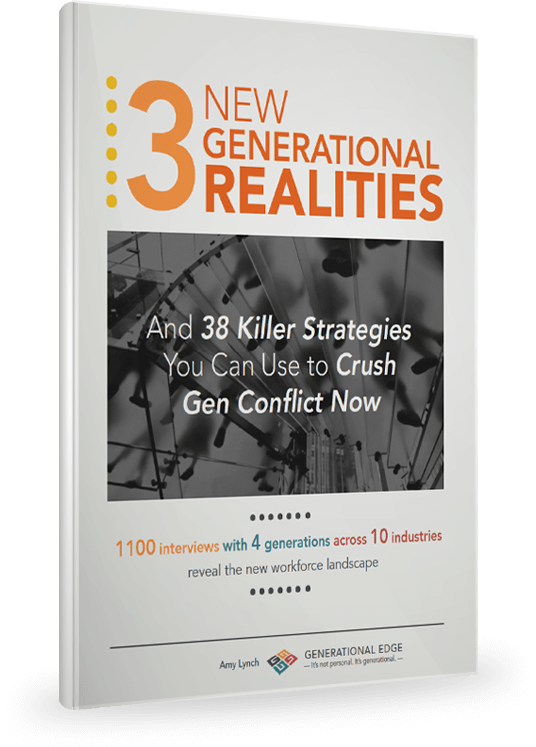 Divided into sections for the Millennial Manager, the Gen X Manager and the Baby Boomer Manager, the guide addresses the most common and troublesome cross-generational clash points with a focus on communication, time, authority, technology, and loyalty. Best of all, it’s tailored to your needs. We work with you to customize your guide to address the specific generational challenges managers and leaders encounter most often within your industry and your organization. Every team member must be a life-long learner these days, so effective training is absolutely essential. However, designing instruction is difficult because different generations learn so differently. Boomers grew up learning from books. Reading trained Boomer brains to focus, reason deductively and think in linear ways. Meanwhile, reading moved lots of information into Boomers’ long-term memory banks. In contrast, Gen Z and Millennials grew up learning online. 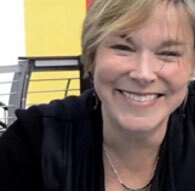 They developed jugglers' brains, able to process high-speed data, to make innovative connections, and to employ 3-D thinking and mental mapping. As a trainer, how can you reach such a wide variety of learners? We know it’s not easy. That’s why we wrote our curriculum guide, an easy-to-use reference that helps you link the way each generation learns with specific activities that engage that age group and instruct with impact. The Gen IQ Curriculum Builder links the way each generation learns with specific instructional activities that engage and impact. 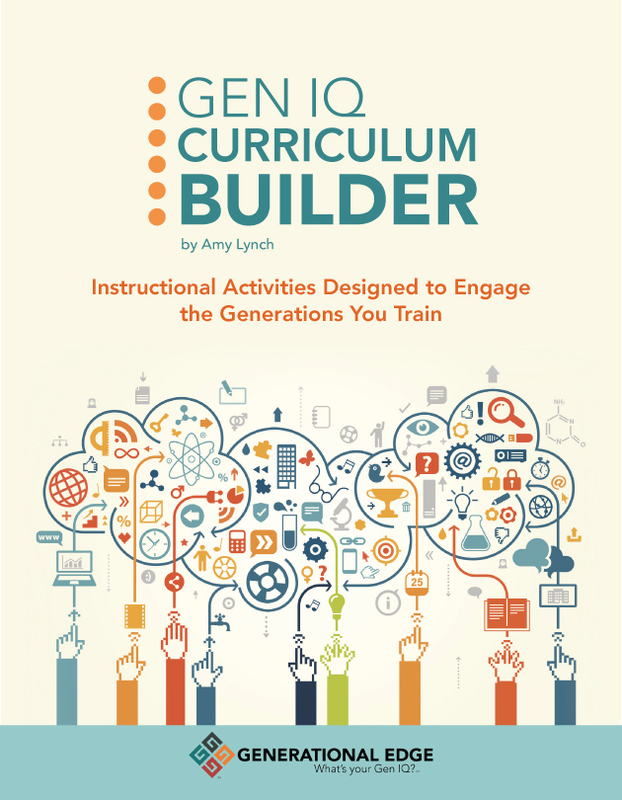 The Gen IQ Curriculum Builder helps you choose with confidence among exercises like role-play, hands-on learning, or working in teams vs working alone. It helps you choose and refine your approach—as a coach, an expert or a guide—depending on the generational mix in your classroom. And we help you add fun into the mix, because we all learn better when we enjoy the experience. “If I can see your face or hear your voice, we’re talking." 1 “The company owns your time during work hours.” 2 “We don’t need to talk about this. Just do it.” 3 “If I can see your face or hear your voice, we’re talking." Sound familiar? Get the solutions!